Sarah Shea works on a piece she did while she was taking the art instruction series at the Alexandria Memorial Library, thanks to a $700 Community Grant from Standing Stone Coffee Co.
Middle school students worked with local artists as part of a art instruction series at Alexandria Memorial Library, including, first row, from the left, Liam McDonald; second row, Sarah Shea, Nathan Rodkey; third row, Henry McDivitt, Aylee Pheasant; fourth row, Kenna Bookhamer, Lexi Beyer, Allison Rodkey; fifth row, Don Dietz, Jodi Peachey and Cathy Lane. A reception was held for budding young artists and their families to celebrate the culmination of their artistic endeavors at the Alexandria Memorial Library Saturday afternoon. About 12 middle school students from Huntingdon Area Middle School and Juniata Valley High School participated in a six-week art instruction series at the library under the guidance of three local artists, Don Dietz, Jodi Peachey and Cathy Lane. This was possible, thanks to a $700 Community Grant from Standing Stone Coffee Co.
Jill McDonald, librarian at the Alexandria Memorial Library, explained how this went from a simple idea to execution. So, beginning in February, the students met Thursday evenings while the three local artists taught students everything from how to draw a person to more abstract art. McDonald also talked about how art became the focus of finding programming to draw middle-school students into the library. “We’re always looking for ideas, and our instructors were willing to help in anyway they could,” she said, noting that all of the instructors volunteer their time with the library in many capacities, including serving as board members at the library. Because of this endeavor, McDonald said this opens up the possibility of more programming for all ages at the library. “It’s opened up a conversation with our patrons who have expressed interest in art,” she said. “Whether it’s providing studio space for adults to come together just like we do for the knitting group, or hosting an event like a paint night. This has opened doors for possibilities for all ages at the library. McDonald is not only grateful to the families that allowed their children to spend their Thursdays at the library, but she’s grateful to the three instructors for their help. For those who wish to see some of the work done by students in the series, it will be on display at Standing Stone Coffee Co. during the month of May. Sophia Harris, 7, of Cresson, reeled in a trout in a youth fishing area sponsored by Ducks Unlimited near Cornpropst Mills Saturday during the opening day of trout season. Duane DeArmitt of Bellefonte and his grandson, Layton Covel,9, of State College, checked out their latest catch at a youth fishing area sponsored by Ducks Unlimited near Cornpropst Mills Saturday during the opening day of trout season. A Pennsylvanian rite of spring was shared between generations Saturday morning as family members and friends gathered on river and creek banks and lake shores, enjoying sunny skies and mild temperatures as they took part in the opening day of trout season. Overnight rains swelled and muddied some streams, but had little impact on the enthusiastic crowds. In his travels Saturday morning, Girt observed a great many younger fishermen turned out for the opening day. “There are lots of kids and youth out,” he said. 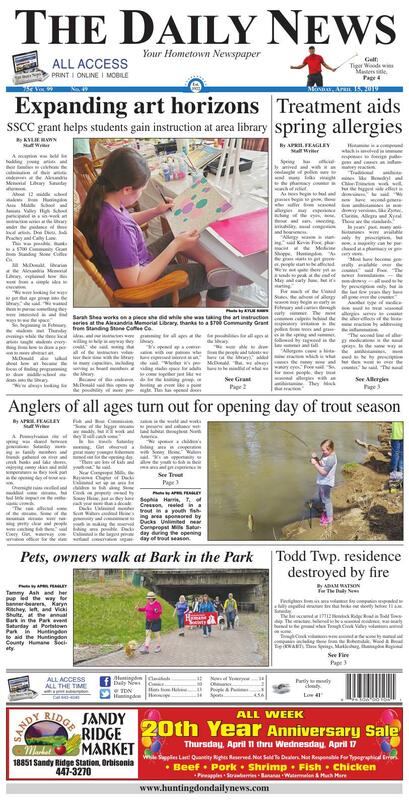 Near Cornpropst Mills, the Raystown Chapter of Ducks Unlimited set up an area for children to fish along Stone Creek on property owned by Sonny Heine, just as they have each year more than a decade. Ducks Unlimited member Scott Walters credited Heine’s generosity and commitment to youth in making the reserved fishing area possible. Ducks Unlimited is the largest private wetland conservation organization in the world and works to preserve and enhance wetland habitat throughout North America. Father and son team Norman and Wyatt Querry, 11, of James Creek, have been fishing together for seven years. Wyatt agreed that time with family was the best part. Duane DeArmitt of Bellefonte is a regular visitor to Stone Creek for fishing season and brought his 9-year-old grandson, Layton Covel of State College, to share in the experience. Sharing the experience with Layton is a chance to carry on a cherished tradition. Sophia Harris, 7, of Cresson, visited Stone Creek with her grandfather, Duane Harris, also of Cresson. She vividly remembers catching her very first fish — a palomino trout — at the same spot when she was 3. From their vantage point near the banks, members of Ducks Unlimited enjoyed the opportunity to share in the excitement as cries of “I got one!,” were heard and wide grins accompanied photo ops with a fresh trout on the line. The children’s fishing area near Cornpropst Mills is operated through a permit granted by the Fish and Boat Commission and will continue to be open only to youth for a period of 30 days. Tammy Ash and her pup led the way for banner-bearers, Karyn Ritchey, left, and Vicki Shultz, at the annual Bark in the Park event Saturday at Portstown Park in Huntingdon to aid the Huntingdon County Humane Society. Spring has officially arrived and with it an onslaught of pollen sure to send many folks straight to the pharmacy counter in search of relief. As trees begin to bud and grasses begin to grow, those who suffer from seasonal allergies may experience itching of the eyes, nose, throat and ears, sneezing, irritability, nasal congestion and hoarseness. For much of the United States, the advent of allergy season may begin as early as February and carries through early summer. The most common culprits behind the respiratory irritation is the pollen from trees and grasses in the spring and summer, followed by ragweed in the late summer and fall. Histamine is a compound which is involved in immune responses to foreign pathogens and causes an inflammatory reaction. In years’ past, many antihistamines were available only by prescription, but now, a majority can be purchased at a pharmacy or grocery store. Another type of medication used to treat seasonal allergies serves to counter the after-effects of the histamine reaction by addressing the inflammation. Two of the most recognizable brands of nasal sprays currently available include Flonase and Nasacort. He added that for all of the name-brand over-the-counter medications mentioned, generics are also available. Firefighters from six area volunteer fire companies responded to a structure fire on Hemlock Ridge Road in Todd Township just before 11 a.m. Saturday. Firefighters from six area volunteer fire companies responded to a fully engulfed structure fire that broke out shortly before 11 a.m. Saturday. The fire occurred at 17712 Hemlock Ridge Road in Todd Township. The structure, believed to be a seasonal residence, was nearly burned to the ground when Trough Creek Valley volunteers arrived on scene. Trough Creek volunteers were assisted at the scene by mutual aid companies including those from the Robertsdale, Wood & Broad Top (RW&BT), Three Springs, Marklesburg, Huntingdon Regional Fire and Rescue (HRFR) and Mill Creek volunteer fire companies. A number of other companies were on standby status for the aforementioned or were canceled en route. The area where the blaze occurred was a driveway just off Hemlock Ridge Road. It was surrounded by large trees and pines and was somewhat isolated and smoke coming from the blaze that could be seen for some distance was the cause for investigation by area residents who called it in. Trough Creek Valley fire chief Chris Bair was attempting to ascertain who the owner of the property was following the fire. Attempts to gain additional additional information before press time were unsuccessful. The blaze rekindled on two separate occasions over the weekend. The initial call ended two hours later on Saturday. Adam can be reached at dnews@huntingdondailynews.com.